Sasha: The original Nikopol Trilogy graphic novel by Enki Bilal and the DAEMON and FREEDOMtm novels by Daniel Suarez. 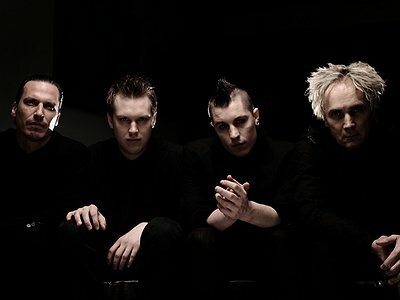 Website / Contact: If you enjoyed this interview with Front Line Assembly, visit their bandcamp profile or their official website for more information and music. Jared: Growing up, my father was a radio station DJ, so music was always present and an essential part of life. Some of my earliest influences included bands like Nirvana, Big Audio Dynamite, Nine Inch Nails, Depeche Mode, Deftones that sort of thing. When I was around 14 or 15, I started playing guitar in some rock bands but it wasn't until I was around 17 or 18 when I first started messing around with programming sounds. Craig: I started writing music as soon as I learned to play guitar at 15 years old. I was always intrigued by trying to create new and unusual variations and sounds. I love the sound of anything distorted or quirky. The ability to create something out of nothing has always appealed to me in a lot of ways throughout my life and music was a perfect outlet for me to slip into. Sasha:I would play the hell out of my mum's Jarre, ABBA and Mike Oldfield tapes and space out. In the mid eighties I began using my older brothers Korg Polysix. Smitten, I then picked up a used Juno 106, MSQ-100 step sequencer, and Digitech delay pedal. My own first cassette purchases were Kraftwerk, RUNDMC, Art of Noise and Depeche Mode. Basically, anything with electronic drums and without cockrock guitars. Sasha: I had sequenced cover versions of Europa And The Pirate Twins by Dolby, Almost by OMD and some DM tracks as exercise and in the mid 90's I had a brief stint as a ringtone designer. This was just before handsets could playback mp3s, so I would reverse engineer/re-sequence top 40 songs on the Yamaha XG (Extended General Midi) chipset that was baked into those phones. This taught me a lot, especially how to shoehorn the fundamental elements of a song into limited polyphony. The Gameboy camera sequencer was also pretty fun and I used it on some remixes in the past. Craig: When I first started to play I would learn from tablature, I would just learn a riff or two from a song that would catch my ear. I was never too interested in playing whole songs. I guess learning the mechanics of catchy riffs, and constantly switching up between a variety of styles helped me developing my own personal style. I doubt I would even make music if it weren't for listening to someone else's amazing music in the first place. Jared: Obviously having a limited amount in gear in the beginning was a challenge for us, it was frustrating not being able to create that certain sound you were imagining. Another challenging situation for me personally would have been relying on alcohol or drugs in order to be creative. There have been many years of which alcohol was almost mandatory when working in the studio, both in terms of creativity but also motivation. Although that has changed to degree, it still persists in some way and is a challenge I would very much like to overcome. Craig: When i first started writing music the hardest part was finding band mates that shared the same vision. It was hard to find people who were consistent and always showed up to practise. I wrote a lot of things on my own and wasn't the best at improvising. I can understand why that never worked out for me. Over time I've realized my main challenge is “relying” on other people to complete a task. once I got a computer workstation the sky was the limit. Back then I would write for hours and hours on the computer and make anything I could imagine. Now over the years my challenge is finding time and mental state to complete my creations. Sasha: Audio recording was very much an afterthought until I bought my first PC in the mid 90's and started using Cubase 24. Before that I would sequence everything on an ATARI 1040ste with Cubase 2.0 and do a one shot pass to stereo cassette, years later, to stereo DAT. These days absolutely anything is possible on a budget, no need to elaborate. My relationship with equipment is probably similar to that of most of your musically inclined readers. I have bought and sold more gear than I can remember (and have met many great people in the process!) For the last few years I've been getting mileage out of the Pro-One, V-Synth 2.0, AN1x, DSR-2000, DX-7S, JX-3p, Juno60, and MicroMoog. On the VST side of things, well, whatever I can get my hands on but notable mentions would be all things U-he and my back catalogue of 32bit (R.I.P.) plugs from the last 20 years. Sampling is all handled ITB as I think that hardware samplers were the first against the wall when the DAW revolution hit. My most missed synths are the Semblance, and JP-8000. Craig: A pc with an 8 input sound card, Cubase, some microphones, guitars, amps, and any software I could get my hands on for creating electronic elements (Fruity loops and Reason mainly). The main evolution of my setup has been more towards physical synths and less guitar. starting to use new software such as ableton has opened up a lot of creative possibilities I could never execute before. My most important synth is my Virus ti desktop, that synth is designed perfectly for the way I create sounds. Drum machines/software are also very important to me because I've never found a drummer that I could keep happy. Jared: My very first keyboard ever was a Yamaha TYU-30. My earliest studio set up was pretty simple, basic Edirol sound card with FL Studio (Fruity Loops back then), a midi trigger and some soft synths. Over time it has obviously grown to include a lot more pieces of hardware. I made the switch from Logic to Ableton around 5 years ago. Some of my most essential and used pieces of gear include the Virus TI, ATC-1, Roland Gaia, M1R, E-MU, Mo Phatt, TG77. Craig: I use technology to repeat my feelings so I can layer more feelings on top of the initial ones. Without technology I would have given up writing a long time ago. So I would say machines are better for consistency and integrity, and humans are better at having a soul. Sasha: I often refer back to metering and spectral analysis while writing and mixing. Visual feedback can be very useful but should only be a general guide. Production tools, from instruments to complex software environments, contribute to the compositional process. How does this manifest itself in your work? Can you describe the co- authorship between yourself and your tools? Sasha: Haha, "complex software environments". The last thing that I personally want is complexity in my software user experience. Creatively I would much rather be re-patching ALL THE THINGS for an hour than debugging something like Reaktor/OSC/MAX, or anything that resembles XML. There was a brief dalliance with controllerism back in the day but workflow suffered. Craig: I only work in software environments, I create midi parts for all instruments of a song and craft the sounds bit by bit as the song grows. I always start with just a simple beat and then play a melody or bass line and work from there. Without the drum machine I would be lost playing random things infinitely until I got bored and quit. I need tools but without me they are silent. "Craig: I use technology to repeat my feelings so I can layer more feelings on top of the initial ones."